Sue Manley introduced me to this one. This is like banana bread, but you add pineapple to this and finish this bread with a cream cheese frosting. Sue Manley introduced me to this one. 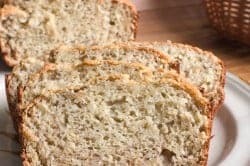 Humming bird bread combines banana bread with pineapple. Combine first five ingredients; add eggs and oil, stirring until moistened. DO NOT BEAT Stir in vanilla, pineapple, pecans and bananas. Bake in three 9-inch round layer pans at 350 degrees for 25 to 30 minutes. Cool in pans 10 minutes Turn out and cool completely Frost with cream cheese frosting. This is a great version of banana bread.